MIAMI — Louisiana Tech (5-3, 3-1 C-USA) cruised to its fourth straight victory with a 44-24 win over FIU (3-5, 3-1 C-USA) Saturday night at Ocean Bank Field at FIU Stadium in Miami. FIU cut the lead to 10 points in the third quarter, but LA Tech outscored the Panthers 17-7 from that point on and put the icing on the cake with Carlos Henderson’s 92-yard kick returned for a touchdown late in the fourth quarter. Ryan Higgins kept the ball out of danger with a 22-for-30 passing performance for 269 yards and three total touchdowns, including one rushing score. Trent Taylor led the offensive attack with 11 catches for 156 yards and a touchdown, while he became just the fourth player in Louisiana Tech history to register 1,000 yards in consecutive seasons. Henderson added six catches for 68 yards, not including his 176 return yards on the night. Jarred Craft rushed the ball 12 times for 60 yards and also caught two passes for 16 yards on the night. Former Haughton star Jarred Craft rushed for 60 yards on 12 carries and caught two passes for 16 yards. FIU got on the board first when a 24-yard field goal gave the Panthers a 3-0 lead over LA Tech with 8:31 still remaining in the first quarter, but LA Tech countered on its opening offensive drive with a 42-yard field goal by Jonathan Barnes after Carlos Henderson’s 50-yard kickoff return gave the Bulldogs good field position. 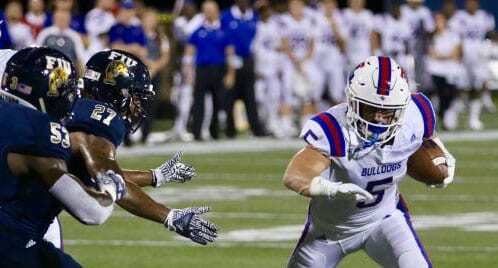 Higgins gave the Bulldogs a 10-3 lead later in the first quarter after capping off a 59-yard drive with a six-yard rushing touchdown to give LA Tech a seven-point lead over FIU. The Bulldogs extended their lead to 17-3 over FIU to start the second quarter of play when Kam McKnight barreled into the end zone from the four-yard line for his sixth rushing touchdown of the season. Barnes connected on a 31-yard field with four minutes remaining in the first half to make it a 20-3 lead, which was cut short by FIU’s last offensive drive of the half that ended with a 17-yard touchdown pass from Alex McGough to Jonnu Smith to make it a 10-point game. With under a minute remaining in the first half, LA Tech responded quickly by driving 67 yards in 40 seconds before Higgins connected with Trent Taylor for a 26-yard touchdown to give the Bulldogs a 27-10 advantage at the halfway mark. FIU cut the lead to 10 once again on its first offensive drive of the second half thanks to a 30-yard touchdown pass from McGough to Thomas Owens to makes it a 27-17 lead for LA Tech. With FIU driving midway through the third quarter, Xavier Woods recorded his 13th career interception and returned it 45 yards to the 2-yard line to set up Higgins’ 1-yard touchdown pass to Kam McKnight to give LA Tech a 34-17 lead with under four minutes to go in the third. Early in the fourth quarter, Barnes tacked on a 23-yard field goal to extend LA Tech’s lead to 20 points and make it a 37-17 advantage for the Bulldogs over the Panthers. The Bulldogs now return home to play hosts to the Rice Owls Saturday, Oct. 29 at 6 p.m. in Conference USA play at Joe Aillet Stadium in Ruston.